In putting together the Heart of Faith Pilgrimage, the leaders have been inspired to work together as a team to build an experience unlike any other available. Groups have been traveling to Jerusalem and the environs for thousands of years. Almost always, they travel with “their own kind.” The places visited may be similar, but the intents differ widely, and that intention has everything to do with your experience. Are you prepared to open your heart; to expand your own faith—wherever and whatever that is for you— to go beyond your current experience; to immerse yourself in a mystical view of the Sacred; to share in the heart of the Divine in the land where so much began? All of our leaders is uniquely experienced and qualified to meet you where you are and to bring you deeper into the spiritual life, regardless of your path. This group is not a “tour”, though it has many elements included on tours. It is a pilgrimage in that pilgrims go to sacred places seeking a blessing and profound inner change. But it is more—it is a call to travel together to BE a vibration of unity and healing, merely through your presence; to give at the level of Spirit, in addition to receiving. Do you feel that call? The Heart of Faith Holy Land Pilgrimage 2013 will truly be a life-changing experience, starting the moment your register, till long after you return. Contact us for last minute discounts. *After January 4, 2013, subject to availability and price adjustment. HOTEL ACCOMMODATIONS are provided on the basis of double occupancy: two persons sharing a room with private bath, in the hotels selected for the tour. FROSCH, Sanctuary Center, LLC, and its subagents reserve the right to substitute hotels of the same category when necessary for the proper handling of the tour. MEALS included are 10 breakfasts, 2 lunches and 10 dinners, as per itinerary. PERSONAL TIPS to your guides and drivers. TOURING IN ISRAEL is provided by modern air-conditioned/heated motorcoaches, and includes the full sightseeing program outlined in the itinerary. AIR TRANSPORTATION. Group airfare available from Newark on United Airlines $1,117 per person (Economy Class). The airfare available for the group is based upon the Super Advanced Purchase Excursion fare in effect for a minimum group of 10 persons traveling together, and is subject to change. The tariff governing this airfare contains conditions and restrictions on its use. Frosch International Travel reserves the right, and if warranted, will pass on to participant, any price increase due to government airline tax increase and/or increase in fuel charges should they come into effect at any time prior to departure. PERSONAL ITEMS such as laundry, telephone calls, and beverages other than coffee or tea served with the meals. PASSPORTS must be carried by each tour member and must be valid 6 months beyond tour date. Copies of the information pages of the passports must be submitted to FROSCH with final payment. GROUND TRANSFERS, when not on group flights, to be quoted separately. 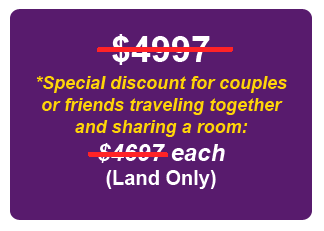 DEPOSIT $500.00 per person ($100.00 of which is nonrefundable; additional cancellation fees will apply, see details under “cancellation penalties”). Submit deposit with registration form to reserve space. (Click “Register Me” button below to be taken to the registration form page). United allows one (1) checked pieces of baggage per ticketed customer. Size and weight limitations apply. Mileage upgrades are not permitted with special negotiated fares. Schedules are subject to change by the airlines. This tour is arranged by FROSCH, One Greenway Plaza, Suite 800, Houston, Texas 77046 and Sanctuary Center, LLC./ dba Heart of Faith Pilgrimages. (“Sanctuary Center, LLC”) All tickets and coupons governing transportation and other services and facilities furnished are issued by FROSCH, only as agents for such other companies furnishing such services and facilities, and neither they nor their sub-agents shall be held liable for loss or damage to property or injury to person caused by reason of any defect by any transportation company, agent, or any such party providing such services. In addition and without limitation, FROSCH, Sanctuary Center, LLC, and its sub-agents are not responsible for any injury, loss, death, inconvenience, delay, or damage to person or property in connection with the provision of any goods or services whether resulting from, but not limited to acts of God or force majeure, illness, disease, acts of war or civil unrest, insurrection or revolt, animals, strikes or other labor activities, criminal or terrorist activities of any kind, physical activity (to include walking, hiking, climbing) participated in by tour participant, overbooking or downgrading of accommodations, mechanical or other failure of airplanes or other means of transportation, or for any failure of any transportation mechanism to arrive or depart on time. The airlines concerned are not to be held liable for any act, omission, or event during the time the passengers are not on board their planes or conveyances. The passage contract in use by the airlines concerned, when issued, shall constitute the sole contract between the airlines and the purchasers of this tour. FROSCH, Sanctuary Center, LLC, and its sub-agents reserve the right to withdraw services and make changes and alterations in the itinerary or trip component at any time and for any reason as may be necessary in their judgment for the proper handling of the tour with or without notice and/or to substitute airlines, hotels of a similar category and FROSCH shall not be liable for any such changes. If due to weather conditions, flight schedules or other uncontrollable factors, it would be necessary to spend an additional night(s), you will be responsible for your own hotel, transfers and meal costs. Baggage is entirely at owner’s risk. The right is reserved to decline to accept perspective participant or participant as a member of this trip at any time. In any such event FROSCH’s sole obligation is to refund any unused accommodation or other unused trip component. Participant certifies not to have any mental, physical or other condition or disability that would create a hazard for himself/herself or other passengers. **As being informed by the above information, you are advised to purchase the trip cancellation and interruption insurance offered by FROSCH and there will be no misunderstanding before, during or after your trip. TOUR MEMBERS NEEDING SPECIAL ASSISTANCE: Any disability requiring special attention should be reported to FROSCH at the time the reservation is made. FROSCH will make a reasonable effort to accommodate the special needs of disabled tour participants, but is not responsible if unable to do so. FROSCH, Sanctuary Center, LLC, and its sub-agents are not responsible for any denial of services by carriers, hotels, restaurants or other independent suppliers. We regret that we cannot provide individual assistance to a tour member for walking, dining, getting on and off motorcoaches and other transportation vehicles, or other personal needs. Travelers who need such assistance must be accompanied by a qualified companion. *SHARED ROOM: If a roommate is requested and one cannot be confirmed prior to the tour, the tour participant must pay the single supplement in order to receive final documents. If FROSCH succeeds in finding a roommate, but one of the parties intending to share the room should cancel, the remaining party must pay the single room supplement. Neither FROSCH nor Sanctuary Center, LLC assumes responsibility for roommate assignments that do not work out. TRIP LEADERS: While no changes are anticipated, in the unlikely event that the tour leader and/or spiritual director named on this site, brochure or in the itinerary cannot travel with the group and a substitute is not named therein, FROSCH & Sanctuary Center LLC reserve the right to make substitutions for such person(s). FROSCH & Sanctuary Center LLC are not responsible for any misquotes contained in this online or print brochure or other accompanying documentations and the contents therein may be changed at any time without notice and at FROSCH or Sanctuary Center LLC’s sole discretion. FROSCH & Sanctuary Center, LLC disclaim any liability for statements, actions or inactions of any intermediary agents such as group administrators, spiritual directors or tour leaders, travel agents or any other intermediary involved with the selling, promotion or operation of this tour. PHOTOGRAPHY and VIDEOGRAPHY: The photos shown on this website and in related printed brochures for this pilgrimage are intended only as samples of the sites in and surrounding areas mentioned in the itinerary. Unless specifically mentioned in this website’s itinerary or accompanying brochures, no implication is made that these sites will be visited or seen on this pilgrimage. FROSCH and Sanctuary Center LLC reserve the right to take photographs and videos during the operation of the pilgrimage and to use such photographs and/or videos for promotional purposes. Any participant who prefers that their image not be used is asked to notify FROSCH or Sanctuary Center, LLC in writing prior to departure.